If you choose cherry tomatoes, use the ripest ones you can find. If they are not perfectly ripe, you may need to balance their acidity with some sugar. taste the broth right before adding the fish and add 1/2 teaspoon sugar if it tastes too harsh. Although we included only a modest amount of hot red pepper flakes, feel free to add more to suit personal preferences. (Some sources suggested that “crazy water” was actually a reference to the broth’s spiciness.) We like to serve this dish in wide, shallow bowls that will accommodate both the fish and the broth. We rest the fish on top of crostini, which soak up the flavorful broth and add a bit of heft to this otherwise light dish. 1. Tie together the parsley stems and oregano sprigs with a short piece of kitchen twine. Heat the oil, garlic, and hot red pepper flakes in a 12-inch skillet over medium-high heat. As the oil begins to sizzle, shake the pan back and forth so that the garlic does not stick (stirring with a wooden spoon will cause the garlic to clump). Once the garlic turns pale gold, about 2 to 2 1/2 minutes, add the onion and 1/2t salt and cook, stirring frequently, until the onion is translucent and lightly browned, 3 to 4 minutes. Add the tomatoes, wine, herb bundle, and 2 cups water and bring to a boil. Reduce the heat to medium, and simmer until the flavors have blended, about 10 minutes. 2. gently slide the fish fillets, skin side down, into the liquid. 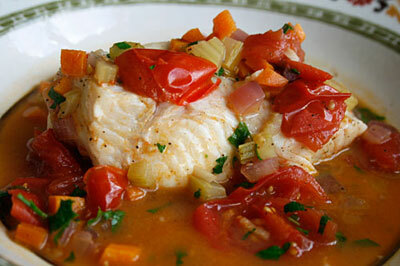 With tongs, arrange the onion slices and tomatoes over the fish. Reduce the heat to low, cover, and simmer until the fish is cooked through and just beginning to flake, about 10 minutes. Sprinkle the minced parsley over the fish and season the broth with salt and black pepper to taste. With the edge of a spatula, cut each fillet into two portions. 3. Place one crostini in the center of each individual serving bowl, set a piece of fish on each crostini, then ladle some broth over the top. Serve immediately, passing the lemon wedges and extra crostini at the table. From the editors of Cook’s Illustrated.